Rose of Arden: 200000 hits. Starting in January 2010. And apart from one small hiccup the the blog has had at least one posting each day over the last four years. Typical of most blogs it was a predictable slow start with few visitors arriving. But then the inland waterways at that time were covered by several notable blogs. I was deliberately trying to be a bit different in the content. I did not want to provide a ships log in the sense of just recording our movements from place to place. So I have varied the content quite a bit, often going off onto subjects that may not have had a watery theme. We had reached the figure of 10,000 visitors by Friday the 29 April 2011 some 16 months after starting. I had noticed by then that there was a regular readership base forming. I started to take note of which posting were being read most and provided more of the same. After two months on Saturday, 18 June 2011 we had reached 15,000 visitors. After a further two months we had reached 20,000 visitors by Monday, 22 August 2011. After three years on the 5th of February 2013 we reached what was for me the landmark 100,000 visitors. After three and a half years on the 30th September 2013 we reached the 150,000 visitors. 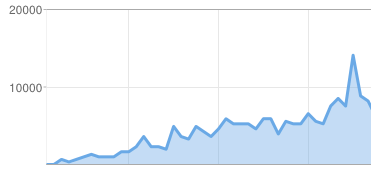 What had been a slow start in the early days of the blog had slowly built up into a steady flow of visitors. I had continued to vary the content and avoided adding items that appeared to be avoided by visitors. The average number of visitors is 3921 per month since the blog started. The average figure over the last six months is 8,333 visitors each month. Well six months after reaching 150,000 and the visitor count has continued to grow. Now the number of visitors to the blog has reached 200,000 which is once again another significant number. A few statistics: The more popular items are as you might expect are the more humorous stuff. The typical number of visitors is around 250 to 300 a day. There are certain days of the week when more people turn up. Wednesday seems to be very popular so I can only imagine that Wednesday is not only a bad football team but also a bad day for television? As 'Rose of Arden' is just one of eight blogs in total that I write for. (Some of which have a closed membership) Add into the mix the occasional article posted on NarrowBoat World, as well as dipping in from time to time on the odd canal forum. Blogging and writing is keeping me busy in retirement.